Two large bedrooms , one with a King Size bed , and En suite Bathroom with corner bath and shower, and the other with a double bed, A separate shower room, A well fitted kitchen, Lovely lounge area, and very light and airy throughout the house. Outside there is a BBQ Area ,gardens and sun loungers to soak up the sun and take in the wonderful views of the sea and surrounding countryside, also a large seating area for out door dinning on the terrace. This property has been finished to a high standard and very well looked after throughout. Price can be negotiable for couple accupancy (2 pax only). Very nice family home. location was great parking was an experience. Warm welcome from Edgar very friendly. Only critic is the place just needs a bit of updating but other than that very nice holiday thank you Edgar. A spacious house with all you need for an enjoyable stay on such a beautiful and interesting island. The house took a while to warm up but the setting more than made up for this. Edgar was very welcoming and spent time introducing the house. Loved being in amongst the fields and the stunning views. We had a lovely stay in this house/cottage. It had everything we could need including a dishwasher, which was an added bonus! View is fantastic, and we sat outside every night enjoying a barbecue and the view. We found it hard to find the first time, but the moment you know where it is, it is very easy. Marina is 5-10 min drive, a little bakery 10 min walking distance and a shop with all the basics you could need. House was very clean and Fernando showed us around and even drove in front of us to the Marina to show where everything was. Excellent stay and would recommend this, to couples, families and small groups. We stayed at Casa Coelha in the end of February and from the first day we could not be more satisfied with our choice. We were met at the Funchal airport by Edgar's lovely wife and she offered to guide us all the way to the house. As we have already been in Arco, we did not want to block her in the evening hours and she explained the exact location and gave us the keys. We had no problems finding the house. 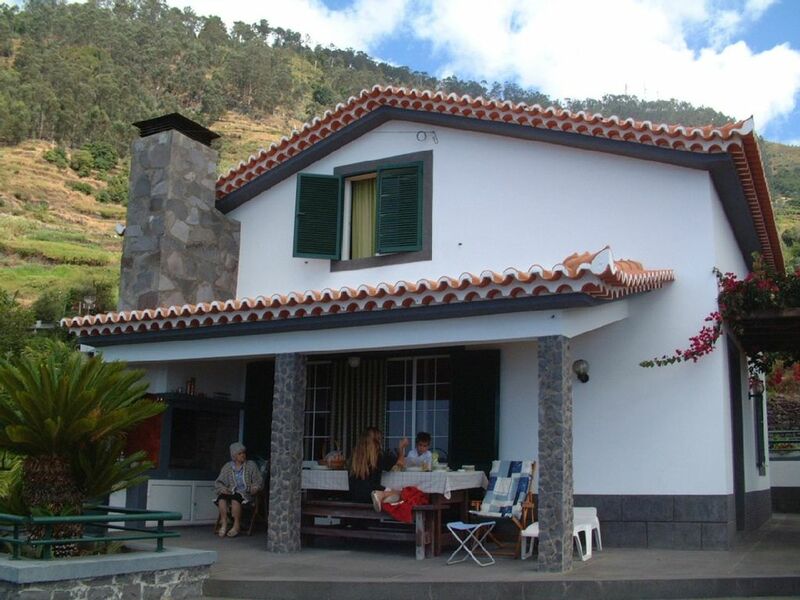 The house is in a truly wonderful location, there is only one small house near by, so there is complete peace and wide open views over the Atlantic Ocean, green forests, gardens and the village of Arco da Calheta. We loved the sunny terrace and our two daughters also liked the green garden with palms and trees at the side and back of the house. Almost every day we had breakfast and dinner outside as the weather was sunny all nine days. Inside the house there was really everything you could need for a perfect stay. Many clean towels, sheets, blankets, crockery, heaters etc. Our girls were so grateful for many toys and special set of towels for them - how nice of the owners to think about this. There was firewood prepared but unfortunately we could not find matches. I asked the neighbours for the fire and they were very kind and gave me the whole box of matches - it is a small thing but we felt even more homeliness after this. Everyday we went for a long walk in different parts of Madeira - many levadas (Levadas das 25 fontes, do Risco, do Caldeirao Verde, do Furado, da Ribeira da Janela, da Faja do Rodrigues, do Paul) and Vereda do Areeiro. We visited Santana, Achadas da Cruz, Porto Moniz, Cabo Girao and two times we were also swimming in Calheta (using neoprene suits). We will certainly recommend the house to our friends and relatives and we would love to repeat our unforgettable holiday at Casa Coelha. Best wishes to Lucilia and Edgar. We arrived on sept.23rd. and stayed til okt.17th. The house is clean, well equiped. It has everything a person need for cooking. We have many hours outside on the south side of the house. Had all our meals out ther, watcing the sunset and the evning lights in the village from there. Edgar is a verry helpfull person, picked us up at the airport and took us to the house.We did not rent a car, but it was busses near bye. The local stores had most of what we needed. We surley recomend this house, even without a car. Ashort walk and you are in Loreto, witch has good piza restaurant. We walked levada witch is nearby. 5 km. to the beach ,at Calheta village,we walked down and taxi back up to the house. We had some fantastic days here. Founded in 1572, the parish of Arco da Calheta is set between the mountains and got its name from the surrounding hills and its proximity to the parish of Calheta. After the discovery of the island this parish was one of the first to be submitted to huge agricultural explorations, giving origin to extensive lands with noble houses, chapels and cultivated areas. The Beach Area of Calheta is a short drive down through the rolling countryside, and boasts golden sandy beaches, and a lovely Marina with cafes and restaurants.